The Dairon Company, world renowned for its RotaDairon stone burier range of products, has developed machines suitable for the smallest walk behind tractors on the market (from 10 to 18 HP maximum). The STM 75 has been designed to perform the same work as the stony or the RD100 for example. 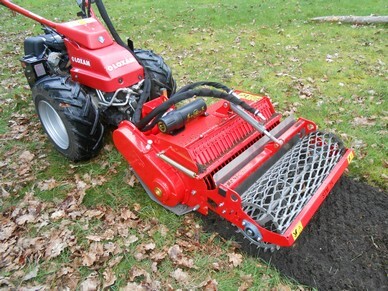 The highest quality cultivation - burying of flints, debris, grass - top soil mixing - rolling. Oversized rotor, non-panning blades (Dairon Patent), unbreakable and unbendable grate fingers, offset roller to avoid ridges between two passes, high quality steel, hydraulic torque limiting system at rotor end (safety for the walk behind tractor and the STM).